PIX! PIX! PIX! 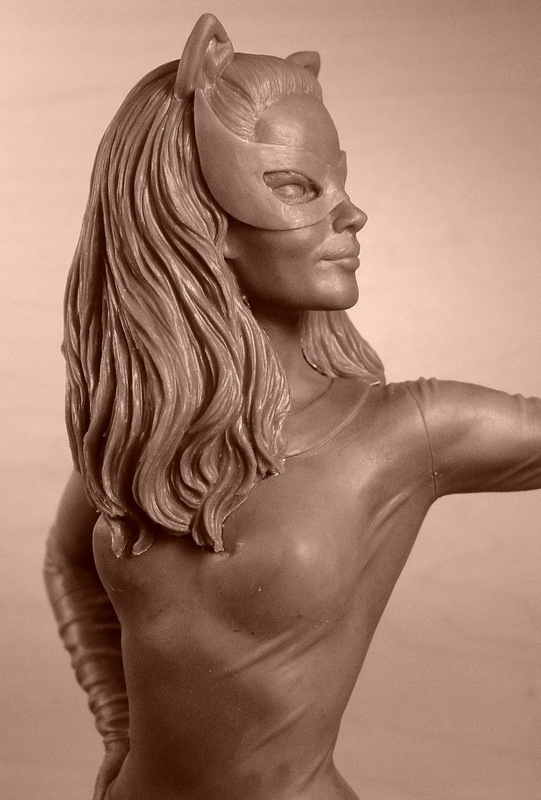 And a Q&A with sculptor Clayburn Moore! PLUS: The mystery of the missing necklace — SOLVED! We’re taking a side trip from our regular weekly BUILDING BATMAN ’66 feature — our series that gives you a peek behind the Bat-curtain at how Diamond Select creates their busts — to bring you an EXCLUSIVE behind-the-scenes look at their forthcoming Julie Newmar statue. 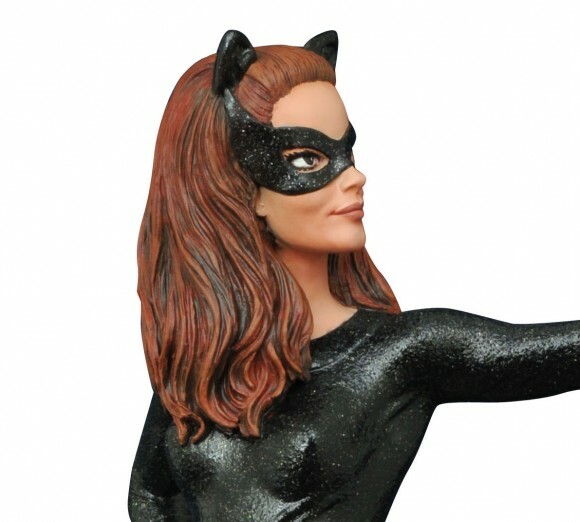 — The First Official Look at the Julie Newmar Catwoman Statue. Click here. Dan Greenfield: How did you pick this particular design? Clayburn Moore: I did a studio portrait shot of Yvonne Craig, but many studio photos of Julie Newmar were in reclining poses. I thought it was an opportunity to do a piece that showed some Catwoman attitude in a standing pose. I also wanted it to engage the viewer so I had her pointing at the viewer as if she had singled them out. 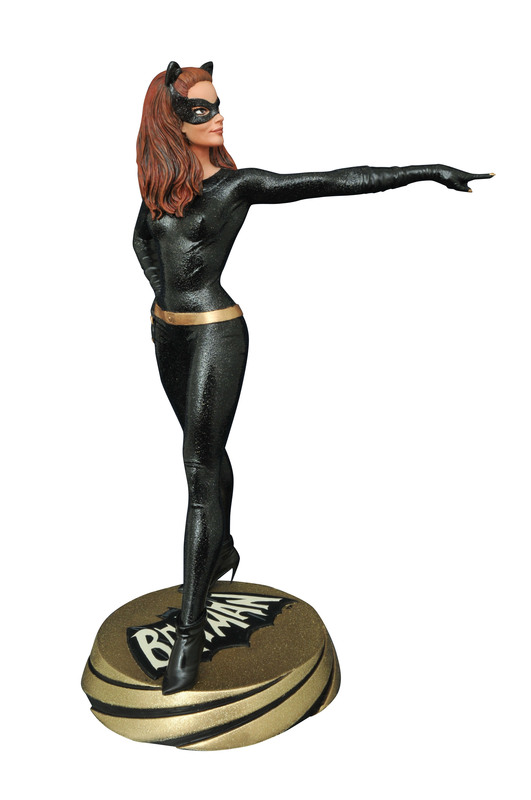 Dan: Julie Newmar defines statuesque. What were the toughest challenges in getting her proportions just so? Clay: Ms. Newmar is very tall and very shapely. 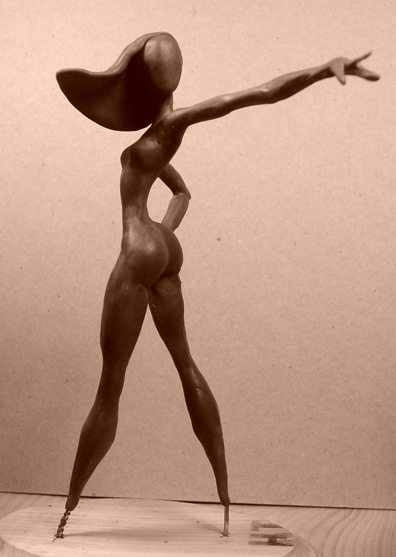 I used photos of her, blew them up to the exact height at which I was sculpting the piece and matched all proportions. Dan: How much input has Julie had in this? Clay: Julie was shown the piece at least at the end if not sooner. There were some tweaks over the process that I found helpful and she may have made a suggestion or two, however, she never seemed to think it wasn’t doing her justice as far as I know. I had met her at a show and described the pose to her and she seemed to like the idea I had in mind. She was very gracious to me and to the fans that had waited to speak to her. She seemed genuinely interested in the project. Dan: What’s your favorite Catwoman episode? Clay: Definitely where she tries very hard to seduce Batman, but fails. I used some nice screen shots from that scene for the body reference as it shows her well from all angles. That is such a terrific scene…. Dan: What’s the coolest part of doing this one? Julie Newmar as Catwoman was one of the very best things about the show. She defined sultry sexiness and she played that role beautifully. I really enjoyed sculpting her face as she has a very special look to her beauty, especially her very expressive lips. These are the details a sculptor has to get right to capture the portrait. I hope I was successful. Dan: A number of readers noticed she’s not wearing the gold necklace in the promo pic. Clay: The plan is to have the necklace, so there will be updated photos later with the added necklace. 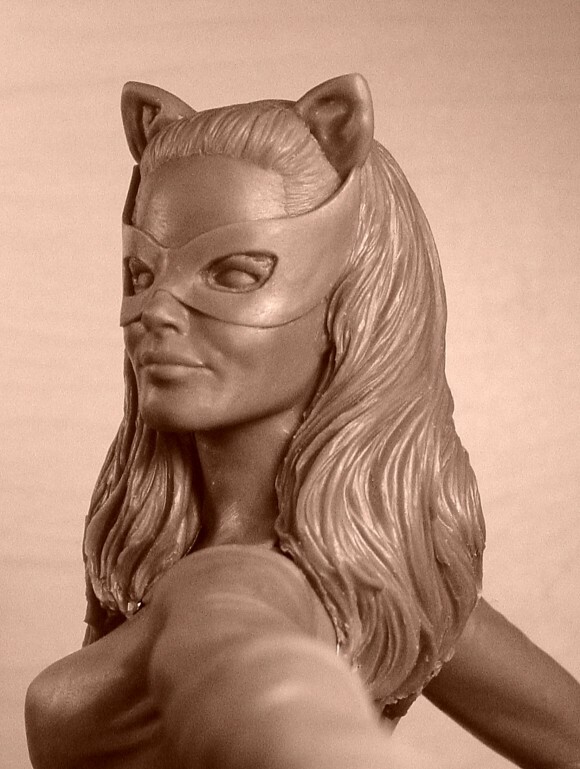 The statue is due out in February and carries an SRP of about $150. Oh, Good Lord! And I thought he had the Adam West likeness and body style down. At least it’s pretty close. Nice. Can’t beat Julie Newmar in her day.